The red-eared slider (Trachemys scripta elegans) is quite common in the pet trade, and introduced specimens have created isolated invasive populations throughout the world. Sometimes referred to as RES, this turtle is quite hardy and adaptable, another trait that has led to its invasive status. The red-eared slider is actually a subspecies of the pond slider (Trachemys scripta). The other two subspecies are the yellow-bellied slider (Trachemys scripta scripta) and Cumberland turtle (Trachemys scripta troostii). All three have similar characteristics, although they differ in appearance. As its common name implies, the red-eared slider's most distinguishing characteristic is the bright, red-orange patch behind each eye. These common pond turtles can reach lengths of up to 12 inches, although 7 to 9 inches is more common; the females are typically a bit larger than the males. Their shells are also patterned, although they lack vivid shell coloration. The shells tend to be dark green with black and yellow stripes. The skin is also dark, typically a dark olive-green color with bold yellow stripes. The shell and skin tend to get darker as the turtle matures; the yellow on the shell and skin may start to fade with age. Like many similar turtles, the red-eared slider starts out life largely carnivorous, feeding on insect larvae, tadpoles and other aquatic creatures. As it matures, however, it becomes largely herbivorous, feeding primarily on aquatic plants. 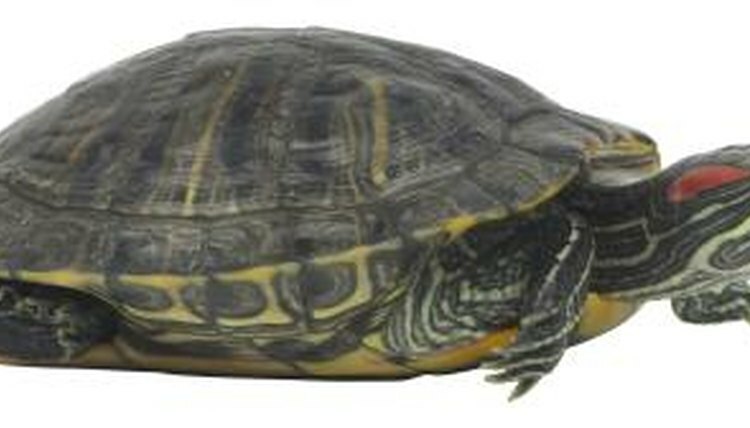 In captivity it generally eats a diet of commercial turtle pellets supplemented with fresh leafy vegetables. As pond turtles, red-eared sliders prefer to inhabit still bodies of water such as lakes and ponds. Their preferred habitat is thick with aquatic vegetation and numerous basking sites such as logs and rocks. Members of the species are aptly named sliders because of the way they will slide from their basking spot back into the safety of the water. Red-eared sliders are native to the area from the Midwest south to the states along the Gulf Coast Basin. Because they're so popular in the pet trade, these small turtles have been introduced into various other areas and are considered invasive in many states.